This 360-degree, stereo panorama of a section of the "Columbia Hills" shows meandering, crisscrossing wheel tracks that NASA's Mars Exploration Rover Spirit left behind while using its scientific instruments to analyze a new class of rocks in Gusev Crater on Mars. 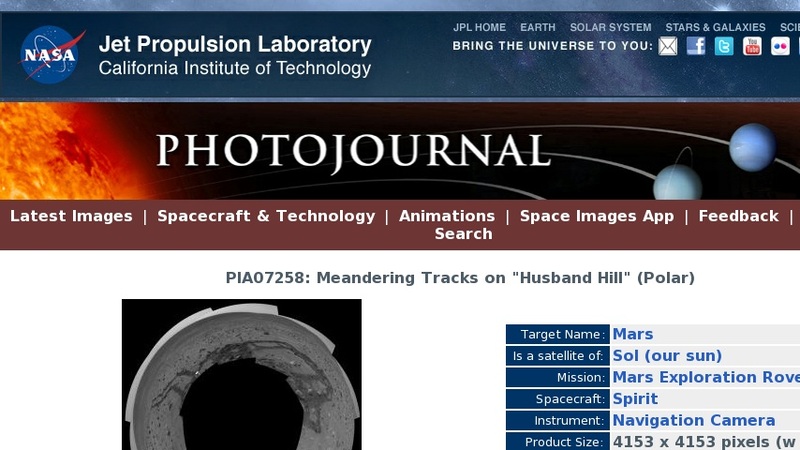 Because Spirit has been experiencing a high rate of slip on the sandy, sloped terrain on this flank of "Husband Hill," scientists are directing the rover to check its progress often to avoid getting a rock stuck in one of its wheel wells. Rocks in this region are higher in phosphorus than other rocks that Spirit has examined. This view is a mosaic of frames that Spirit took with its navigation camera during the rover's 358th and 359th martian days, or sols, (Jan. 3 and 4, 2005). It is presented here in a polar projection with geometric seam correction.